Yves here. Funny how idpol Dems pretty much never talk about the economic hardships African-Americans face, much the less what they intend to do about them. African-Americans are also far more likely to be unemployed. 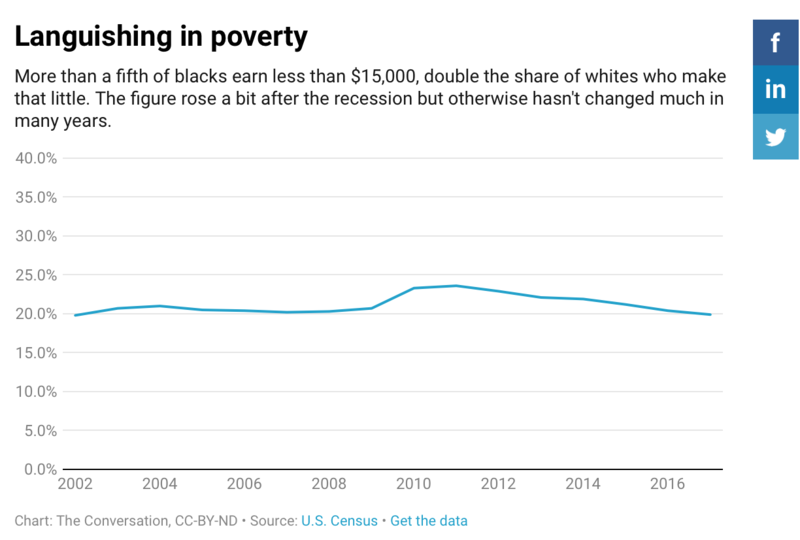 In the years before the Great Recession hit in 2008, for example, the jobless rate among blacks was typically around 10 percent, more than doublewhat it was for whites. I believe the central link tying all these data points together are the racist policies that have been entrenched in America’s financial, economic and educational fabric since the beginning. Examples include Jim Crow lawsas it pertains to legal separation by race in public institutions and redlining policies concerning housing, which further allowed legal barriers to be put in place to impede the upward mobility of African-Americans. This entry was posted in Free markets and their discontents, Guest Post, Income disparity, The destruction of the middle class on February 6, 2019 by Yves Smith. Chance of Nancy Pelosi and her ilk understanding the above : 0. Heck maybe negative. We’re capitalists, that’s just the way it is. Just the way it is now/has been is not the same as “always will be in perpetuity”. Indifference is the opposite of love, not hate. Usually in these types of stories the Asian scores showing they are strongly outperforming whites are deleted or seriously downplayed. If blacks underperform due to white racism, do Asians overperform due to white benevolence? Or do Asians actually have agency? It’s important to tell the story of where we’ve been and what others are doing as well because we look at, for example, Germany, and how they’ve been able or they’re attempt to try to heal after the Holocaust. Germany paid reparations and they went through that process and they had that truth-telling process. And until America tells the truth about itself, we’re not going to heal. Of course there was never any redlining for the Mexican or Puerto Rican communities because for the most part they were considered white back in the day and so small in numbers as to be inconsequential. But with whites rushing into minority status and there being no way that Asians are going to pay reparations, there is an ever decreasing white wealth pie that is now being gobbled up by not only blacks but an ever increasing number of Hispanics. So the idea that poor black economic performance is due to redlining is undermined by the fact that Hispanics underperform not quite as much and Asians overperform. It’s almost as there might just be another, more controversial, more cognitively based explanation for the relative economic performances of these various groups. Especially since all over the globe we see very similar economic performances, the vast majority of these places having never suffered from FDR’s redlining. Highly emotional nature vs. nurture debates will go forever when it is most likely equal combinations of both that determine cognitive ability but what is undeniable is that the income rankings match almost exactly the average IQ scores of the various races and ethnicities. Does anyone really doubt that cognitive ability matters? Be that as it may, what is the best society for blacks to have a chance to be equal economic partners? Obviously if they want equality then living in an all black society would ensure they would by definition be equal, at least on the racial level. But blacks living on the bottom of wealthy white societies have much better standards of living than blacks living in black countries. So the ideal situation for blacks would be to living as a small minority in a wealthy white society on the condition that jobs on the lower level of cognitive ability would be well remunerated, which in the US has historically not been the case. This was the United States in the early sixties when whites were around 90% of the population and blacks around 10%. Due to Cold War pressures to feign the universality of the American Dream, massive numbers of Asians and Hispanics were allowed to enter America. Since Asians actually outperform whites economically, not to mention blacks; and at the same time are immune to white guilt wealth extraction appeals, Asians make blacks even more unequal economic players in the US. Hispanics only perform slightly better than blacks economically and therefore compete with blacks for white benevolence / reparations as AOC so clearly demonstrates. Just look at California to see a glimpse of what the rest of America will look like in 40 years. Adjusted for the cost of living, California sports the highest poverty rate in the US. But whites are a dwindling minority who along with Asians hold the wealth and are serviced by a growing sea of Hispanic helots. Blacks are only 6% of the population in California and are being ethnically cleansed out of their formerly redlined areas in major cities and being pushed out to the exurbs or even out of state. In 40 years American children will be stunned to learn that blacks used to live in San Francisco, Oakland, Los Angeles, Chicago, and Harlem. Had this massive wave of non-white immigration never happened blacks would be in a much better situation today having a 90% white population — with much of its historic racism a thing of the past — all to themselves to benefit from. Instead, the future of America is to become New Brazil where blacks will forever be unequal economic players. Stephen Jay Gould, writing in the Mismeasure of Man, demolished the racist canard of differential racial intelligence and, indeed, the existence of race itself, instead showing supposed intelligence differences were the result of social constructs and prejudice. The idea that Blacks are inherently less intelligent that Whites or Asians is a racist lie. Steven Jay Gould on the use, misuse, and misinterpretaton of IQ Tests. approx. 7 minutes. Kasia, as someone sporting a Polish nickname, maybe you’d better take a look at the history of U.S. stereotyping of ethnic groups before telling us all about the absolutes of cognitive abilities. You may also want to research the ethnic makeup of places like New Mexico, which didn’t receive its Hispanic population during thet 1960s. And do check out this site’s policies against agnotology. This type of “whites are intellectually superior to blacks” mythology is what allows overt, institutionalized racism, an arguably more insidious form of racism than the vile KKK overt type racism, to take root. Blacks, according to you, must rub their hands in glee at the prospect of eternal economic subservience to whites, provided said whites are morally upstanding enough to engender an economic system fair enough to guarantee that “jobs at the lower end of cognitive ability are well remunerated”. Being South African, i’ve felt the crushing oppression of an apartheid system the very pillars of which were views espoused by yourself above. It is these views, institutionalized as they are today, that continue to unleash a constantly oscillating hammer blow that crushes the economic dreams of black people 25 years after the “end” of apartheid, reducing said black people to mere existence as Dr King said. I don’t doubt what you say, but concrete examples are always helpful, especially for those of us who are not familiar with the details of South Africa’s tortured history. ever decreasing white wealth pie that is now being gobbled up by not only blacks but an ever increasing number of Hispanics. when you use the phrase “gobbled up” in an article about how a community has gotten nothing you reveal something not very positive or insightful in yourself. No mention of the purposeful effort to undermine blacks by people exactly like you who have an extremely negative belief about blacks. I’m glad your comment made it through moderation because identitarian liberals should know that this is what a large number of people think, but unlike you are afraid to say it out loud. The smartest human is not much smarter than the stupidest human. IQ tests often if not always reflect a social aspect, better schools, better IQ. Duh. For instance you yourself may have a very high IQ, but your thought processes are anything but intelligent, you just confirm your belief system and pat yourself on the back. Site policies prevent me from being more specific,but I can certainly call you a racist because in essence that is what you call yourself. Not enough said to rebut this revolting comment but I will stop now anyway and leave some room for others. Site policies prevent me from being more specific,but I can certainly call you a racist because in essence that is what you call yourself. Site policies also prohibit ad hominem attacks and insulting other commenters. If you can’t call a racist a racist, then words are meaningless here. And Kasia is a racist, plain as day. Citing longstanding (and long ago debunked) tenets of scientific racism, and denying the history of segregation and colonialism, are plainly the words of a racist and refusing to call them so only compounds the problem. > If you can’t call a racist a racist, then words are meaningless here. As long as the call-out is done in good faith, yes. I remember the 2008 campaign very well, where the second move for any “Obot” was to call whoever didn’t support Obama a racist, much as anybody who didn’t support Clinton in 2016 was called a sexist. If the NC comment section ends up like the Daily Kos comment section did then, heaven help us all. The commenter clearly states that in his/her opinion, blacks have less cognitive ability than, at the very least, asians and whites. That is racist. “She” is a racist, as demonstrated by “her” repellent comment post. Making note of this is not an ad hominem attack. There were a number of similarly telling ‘conclusions’ in her post below the last one I quoted. They’re all drenched in the same chip-on-the-shoulder, I-and-mine-are-inherent-better crappola that common show up in literate racists’ whine lines. Describing this pattern accurately in no way constitutes an ad hominem attack. Even this: What do these sad jackasses do when they aren’t whining though? Do they ever do the laundry, or does someone else get that done for them? Is not per se an ad hominem attack. It’s just an amusing, tellingly pointed question. > So the ideal situation for blacks would be to living as a small minority in a wealthy white society on the condition that jobs on the lower level of cognitive ability would be well remunerated, which in the US has historically not been the case. I wonder, if we Ask A Black Person™, what their views would be. Surely they are entitled to determine their own ideals? Oh yeah, white supremacist confirmed! Set phasers to stun comrades, we’ll want to put this one in our living museum of antiquated belief systems, along with the goldbugs and the phrenologists. Surely following your logic you should label me an “Asian Supremacist” in response to my exceedingly banal observation that Asians cognitivly outperform other races, including whites. It’s really not about identity. It’s about behavior. Statistically almost 100% of people who graduate high school and don’t have children before they are able to afford them reach middle class status. Somewhere in all of this it seems that those who value education and family exhibit this behavior. Ethinicity and color do not change the outcome. Behavior does. Perhaps incentivizing this behavior would be helpful. Dr. King certainly did. Just a thought. The point isn’t that “ethnicity and color” are the cause of the outcome. It’s that historic and systemic oppression (Jim Crow, red-lining, policing and sentencing inequalities, school funding, lending practices, hiring discrimination….) leave African-Americans more likely to be among those most vulnerable to disruptions like the financial crisis/recession, and those less likely to benefit from any relief or recovery mechanisms. Disadvantages in education and family stability are themselves among the outcomes of the historic and systemic oppression that contribute to this vulnerability. The notion that African-Americans don’t hold those values is incorrect, given that they have been fighting for them for centuries. *** Every act or series of policies reinforces the institutions of power and stabilizes like Chris Hedges’ point about feedback loops — at some point individuals, families, neighborhoods (sacrifice zones), communities and countries collapse under the inevitability that resources are siphoned away from the people who need them the most. These policies or processes are embedded in our institutions to make them impervious to change — unless the s***show gets too big and then they rebrand like Altria from PM. Not to be pedantic, and granting its origins in Federal law, but it was the local NYC Cabaret Card, issued by the State Liquor Authority and required for performers in night clubs, that prevented Billie Holiday and Charlie Parker from working. Billie Holiday was banned from NYC clubs at the time of her death. Lenny Bruce also had his Cabaret Card taken, for alleged obscenity. Strictly speaking, Anslinger had nothing to do with any of this. This racially-enforced law also affected Thelonious Monk, Bud Powell, Jackie McLean, JJ Johnson, Billy Higgins and even Miles Davis. Nina Simone and the spoken-word performer Lord Buckley (whose death shortly after losing his card led to efforts by Harold “Doc” Humes, Norman Mailer and others to repeal the law) were also kept from working, and it was Nina Simone’s challenges that eventually led to the City Council repealing its enforcement. Local 802, the musician’s union in NYC finally got the law completely repealed on the state level in the early 1980’s (!). Michael, I did not take this as pedantic. Your information above contributes to this conversation nicely, though and probably speaks to the need for more institutional research. Will have to look up the incident with Parker. Not pedantic Michael. I appreciate the reply. I was not referring to the performative institutions trying to reframe jazz and who performs, but more of the insidious racists in charge of large institutions (JE Hoover comes to mind as well). Thanks, John, I’ve seen and appreciated the article, and agree with its/your angle on Billie Holiday. Regarding “insidious racists in charge of charge of large institutions,” and the mention of Hoover, it’s even broader and deeper, and “Strange Fruit” is a perfect example, bringing together Cold War anti-Communism and institutional racism. The song’s lyrics were written by Abel Meeropol (a pseudonym for Lewis Allen), an English teacher at DeWitt Clinton High School in The Bronx, and a member of the Communist Party. In fact, the song originally appeared as a poem in a Teachers Union (then unrecognized by the Board of Education, and controlled by Party members teaching in the public schools) publication. This was 1937, when the Communist Party was virtually the only political party in the US with an explicit civil rights platform. Open support for civil rights in this era (and after) was often used by the FBI as a marker for Left sympathies. So, you can see the nexus between race and politics here, and why Anslinger/Hoover/law enforcement would take an interest in the song and Lady Day’s singing of it. Abel Meeropol later adopted the orphaned sons of Ethel and Julius Rosenberg, and they took his name. He also wrote the progressive anthem “The House I Live In,” which was performed by Frank Sinatra in his progressive/new deal period, as well as Paul Robeson (and Sam Cooke). Easy to see how these songs, and their popularity among Americans at the time, must have driven Hoover, Anslinger and their ilk out of their minds. And sad to see how much of it has been effaced from history. Wow, great reply and good information to explore. Thank you for this. 11. A generation of heritable property destroyed by Obama’s refusal to deal with the foreclosure crisis, and foaming the runway for the banks. If that were so, I’d expect you to cite some, like, statistics. Kinda interesting that you don’t do so. Especially as you’re bringing up ‘children before they are able to afford them’, a very vague goalpost with a long racist history – our children are the future, their children are vermin, etc – that does not admit to the idea that the right to a family life is a fundamental human right. In any case, I know plenty of childless people who graduated HS and live in poverty, particularly women – don’t you? Where in all this is Obama? Who apparently thought the presidency was something to be, not something to do. So he did nothing for poor people, who are disproportionately African American. Look, gross inequality and rascist treatment of black people long pre-dated Obama, and continues to worsen following his administration. To expect African Americans to publicly call him out for it is just not realistic. I’m sure there are some who quietly acknowledge his betrayal of his race and class, but very few are going to take this subject on in the way that the Black Agenda Report, for example, does. That’s just the way it is. Read James Baldwin. It’s a feature not a bug. It is repeated ad nauseum in right wing media (Ben Shapiro, etc) that financial circumstances for African Americans are improved by record numbers in the Trump era. The data here seems to end in 2016. Anyone have more recent numbers? When I’ve seen claims like that on twitter, in the replies someone often counters with a chart showing an upward trend line similar to the blue line in the first chart above, extending at what looks like a comparable rate into the Trump years. The contention in the counter-claim is that this is a function of how bad things were in 2009, and whatever the tweeter attributes to the “Obama” recovery, not specific to anything Trump is doing differently. I think I’ve seen similar back-and-forth like this for both income and employment numbers. I have no expertise in judging the source or interpretation of the numbers, but if you see a claim in the twitterverse, looking for numbers in some of the replies may give you an idea of where to look further or interpret the numbers differently. I have been working with the text of ML King’s Letter from Birmingham Jail much these days, for my bread+butter job. 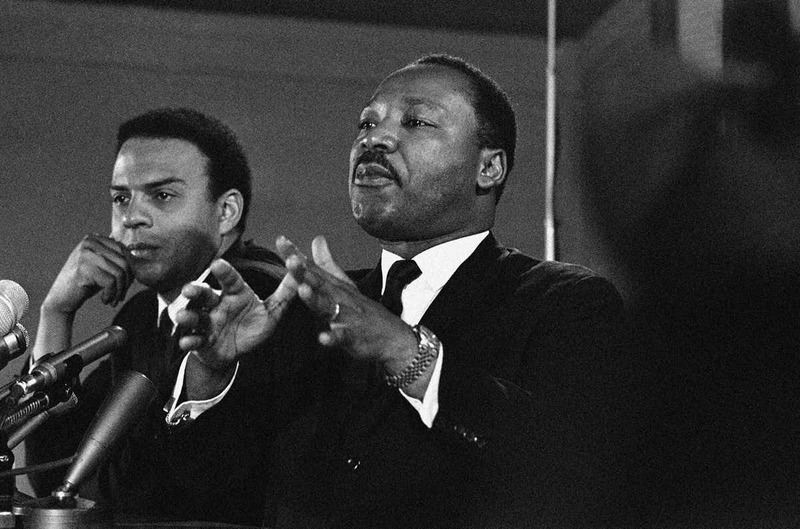 It is important to recall how King called out the “moderate” white clergy who kept telling black people to wait. It is also important to recall King’s strategy of tension when we listen to liberal Democrats and rightwing Republicans and their great fear of protests and strikes. The hierarchs of the Democratic Party are engaged in the last few days in undermining the movement toward Medicare for All Enhanced. This is no surprise. The Democratic Party wants the black community to be a client, the dutiful client who has nowhere else to go and dutifully delivers votes for the non-perform Democrats. At least the Republicans deliver on their terrible promises. The Democrats are currently suffering from a case of exoticism, cultivating Central and South American Spanish-speaking communities, hoping that “demographics” will solve the problem of the glacial progress favored by moderates. Like most multiculturalism, the commitment to the exotic other is deeply superficial. So you have Tim Kaine spouting in Spanish. Hmmm. I notice that no Democrats are making speeches in Portuguese or Cantonese. I wonder why. So this isn’t about identity politics. It is about exploiting one’s clients. Thank you Vincent Adejumo. I was raised in north florida in the early 60’s and my theologically focused parents, great admirers of Dr. King for all of the excellent beliefs he was brave enough to speak to power, bussed this white kid to the black elementary school. For this I am eternally grateful as I see black people is not a frightening statement for me…all I see is people. Sadly we have not come very far from that point. I think one of the more insidious aspects of the illegal immigration flood was to beat down the blacks, as if they have not been beaten down enough. Obviously there is still a lot of work to do. Please gather some of your students and attend the meet up with yves in ft lauderdale, but by the time you go home it’ll be dark, so make sure you have both your brake lights, a warning I’ve never felt compelled to give to a white person. Johnny GL linked to an hour long killer mike interview. If anyone would like to see normal people with black skin, I highly recommend that video. The financial system hits African Americans hard because of the debilitating effects of racism. But to pin *all* the blame on societal or even structural racism obfuscates the problems of a financial system designed to use an individual’s vulnerability to prey on them and make the effects of their precariousness worse. Big data, algorithms, and fintech don’t contextualize circumstances and the effects of inequality, not to mention life’s up and downs. Fix the system for African Americans by fixing the system. Level the playing field. Regulate the use of black-box data that affects people’s financial lives. Regulate the stacking of fees on those struggling or not well-to-do. Regulate predatory lending. It is not as if the financial system is serving society well except for this racism — it preys on the vulnerable period. Low-skilled African American workers have been arguably most negatively affected by illegal immigration. In Los Angeles, many workers could make a decent income in janitorial occupations, as one example. These jobs are now typically occupied by Hispanic immigrants from Mexico and Central America, who are surely hired because of their willingness to work for significantly lower wages. before were significant immigrant receiving states in previous eras of mass immigration. many of these new immigrants in this region are illegal immigrants.